are always being added so bookmark this page to check for updates. Guidelines from the National Institute for Occupational Safety and Health on ways to make the workplace safer for all employees involved in manual material handling. To download a pdf version of the 131 page document click here. Ergonomics for Construction Workers An outstanding resource created by the National Institute for Occupational Safety and Health. This 122 page booklet details ergonomic safety tips for all aspects of a construction worker's job. To download a pdf version click here. Great recommendations from fellow construction workers on saving your hands on the job. Great recommendations from fellow construction workers on saving your shoulders on the job. 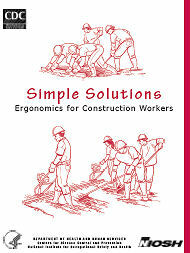 Simple Solutions for Lifting, Holdng, and Handling Materials Great recommendations from fellow construction workers on saving your shoulders and back on the job. Alternative Keyboard designs Great article reviewing alternative keyboard designs and their effects on posture. This booklet helps you select the best available ergonomically designed non-powered hand tool based on peer reviewed articles and expert input. Download a pdf version by clicking here. Useful resource on selecting the proper gloves for any activity. Statistics on hand injuries in the workplace and keys to avoiding these injuries. Useful article on nail gun injuries and ER visits from 2001-2005. What every worker should know for protection from needlestick injuries. Click here for pdf version.